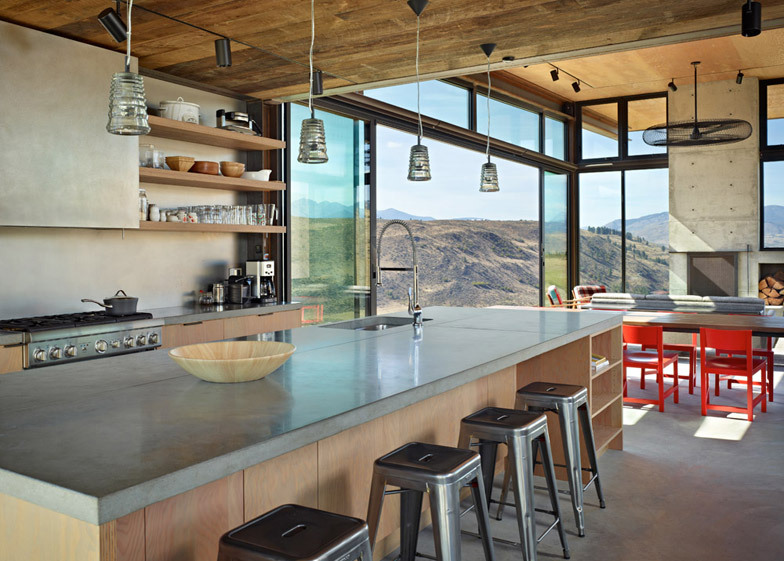 The mountain landscape of Washington's Methow Valley is the setting for this family retreat, conceived by architect Tom Kundig as four structures arranged "like a little campground" around a big rock (+ slideshow). 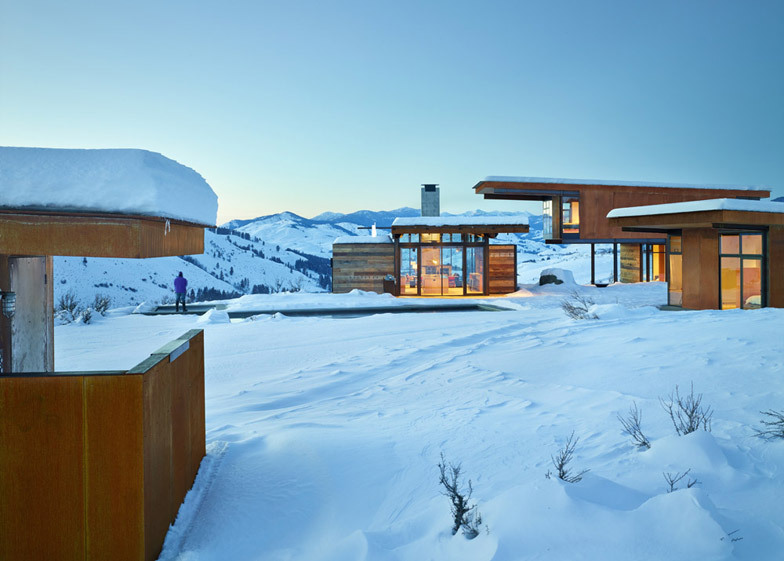 Kundig, one of the principals of Seattle firm Olson Kundig Architects, wanted the house to embody the spirit of adventure created by its remote rural setting – a largely untouched landscape on the edge of a national forest that hosts the USA's largest Nordic ski trail system in winter. 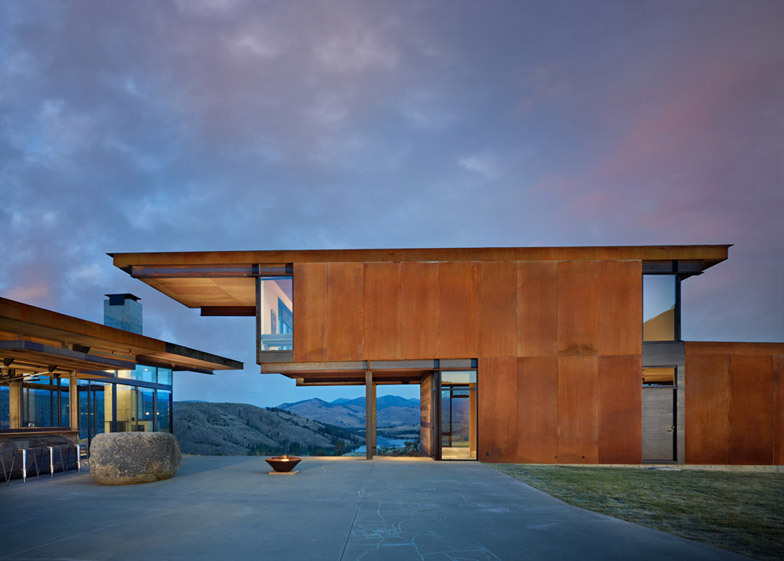 To achieve this, he designed four separate structures, which all wrap around a courtyard and swimming pool in the same way that campers pitch their tents around a fire. 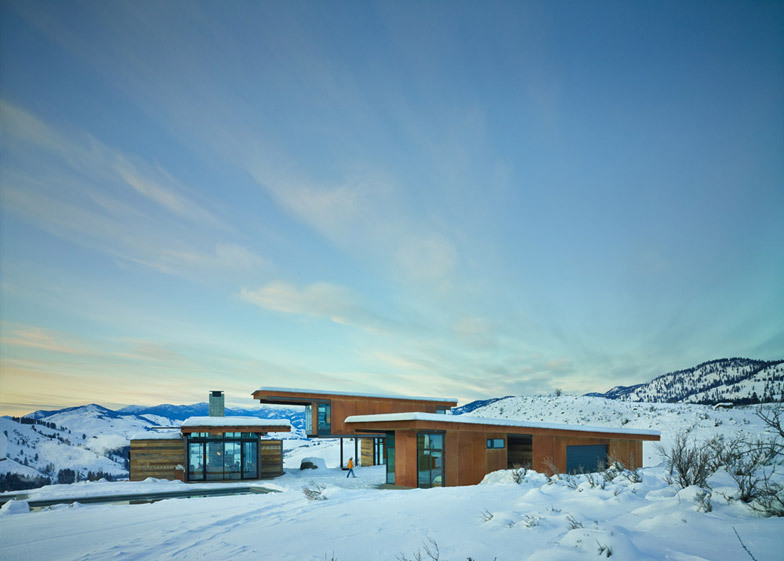 "A house that's all about adventure is one that forces you to be outside and engage actively with the seasons. 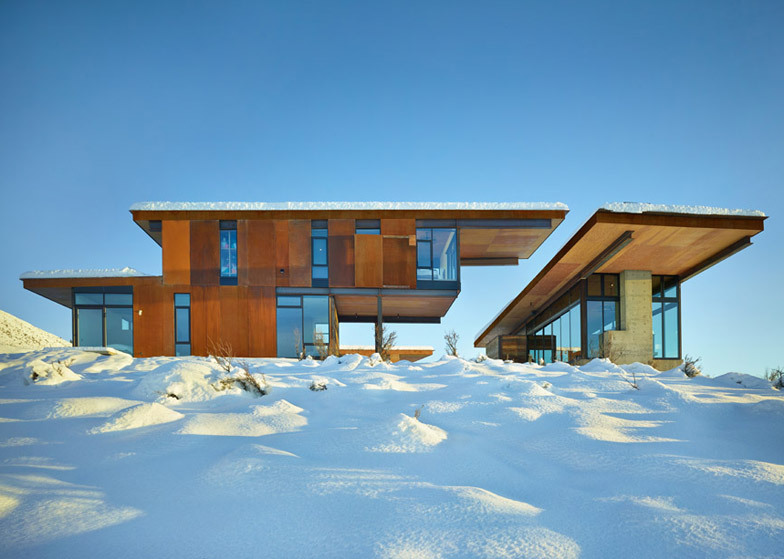 You have to go outside to get inside," said the architect. 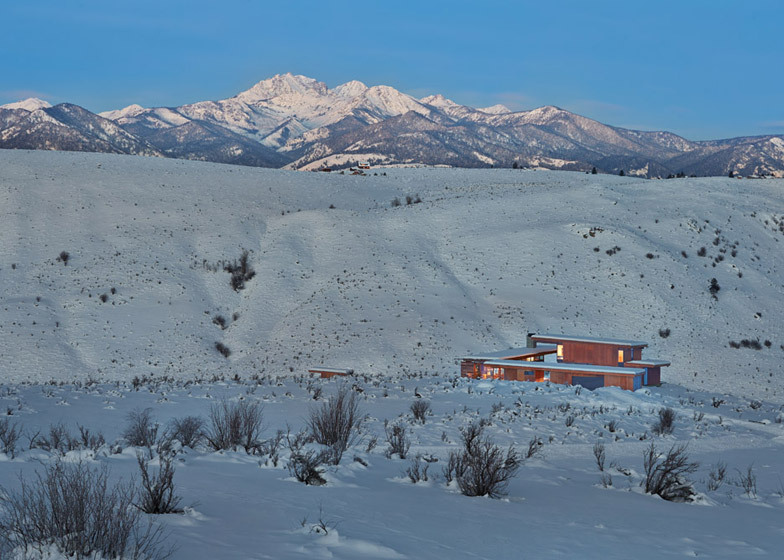 "So the house has inconveniences, but the clients and I see them as terrific moments, unforgettable moments," he continued. 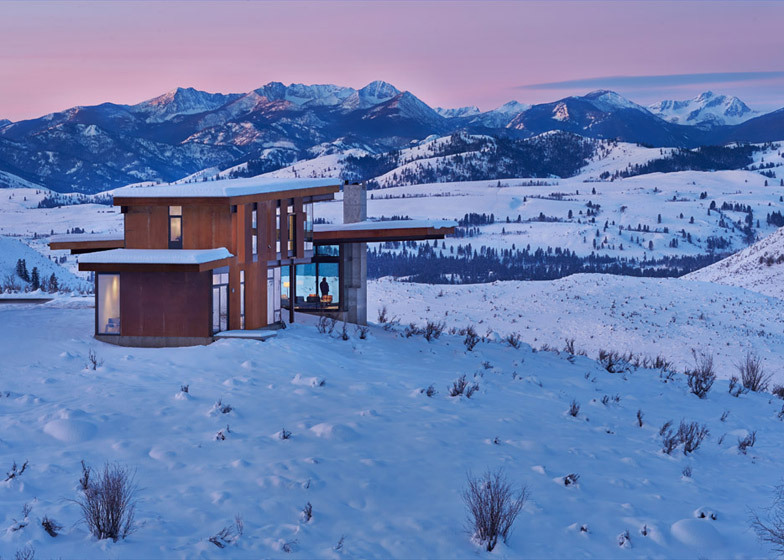 "Adventure is about inconvenience in that it reaffirms and reminds you of where you live." 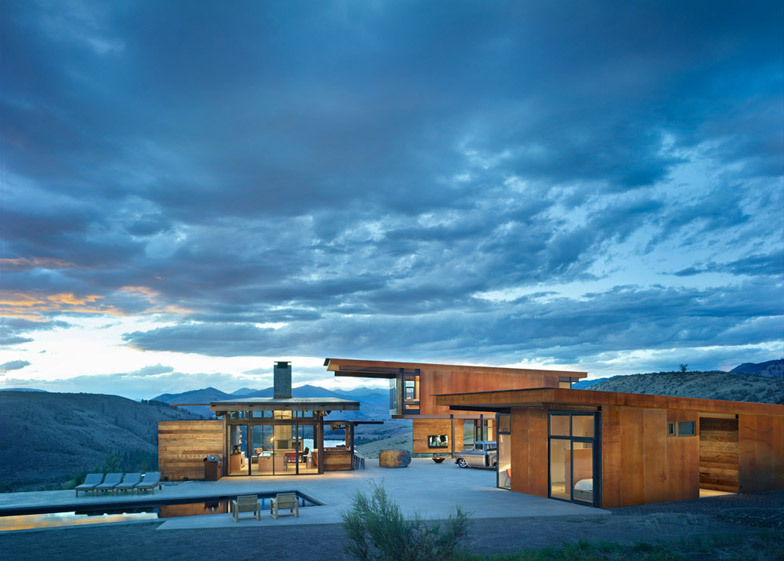 Kundig grew up in Washington state, and many of his best-known projects are rural cabins, like the Delta Shelter from 2005. 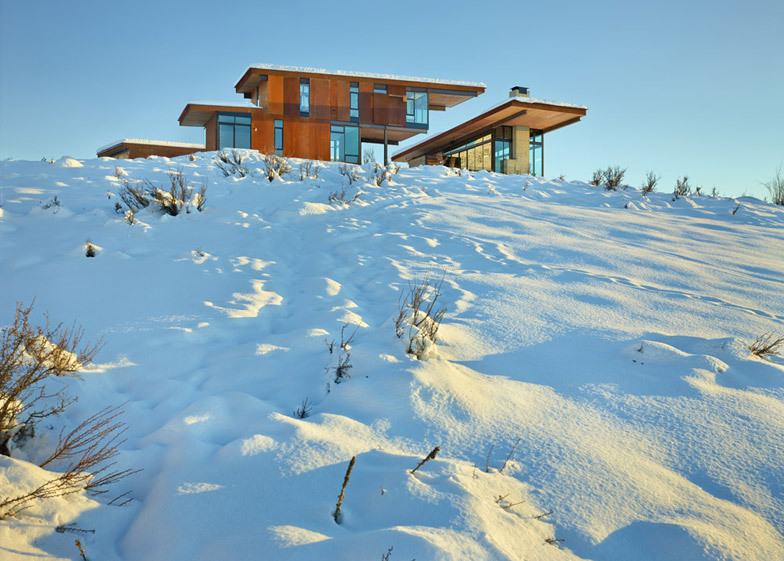 The cabins are designed to suit an environment prone to both scorching summers and winters with heavy snowfall. 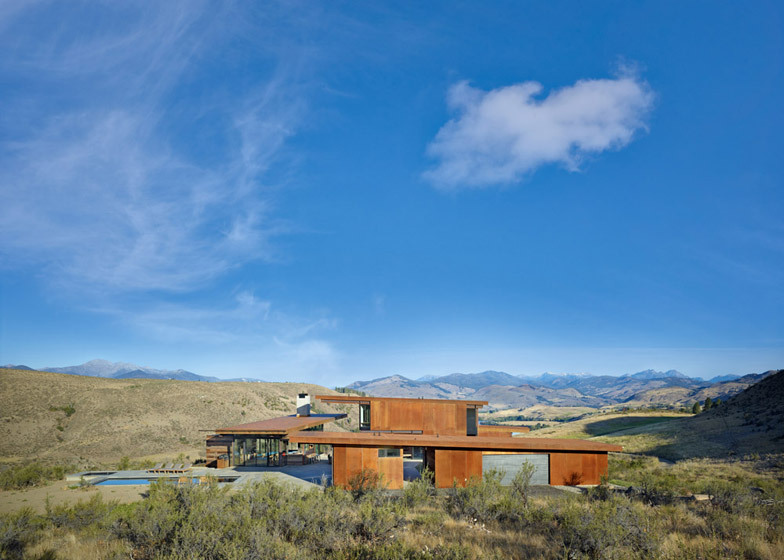 For this house – named Studhorse after its location near the Studhorse Ridge – the exterior is clad with pre-rusted Corten steel, while the interior features wood salvaged from an old barn in Spokane. 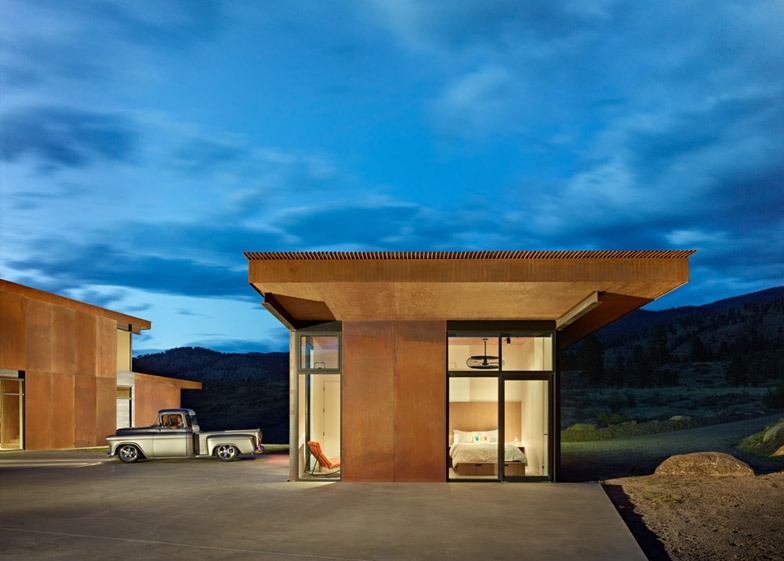 Projecting eaves and cantilevered roofs create shelters at the various entrances, making it easier for occupants to move from building to building. 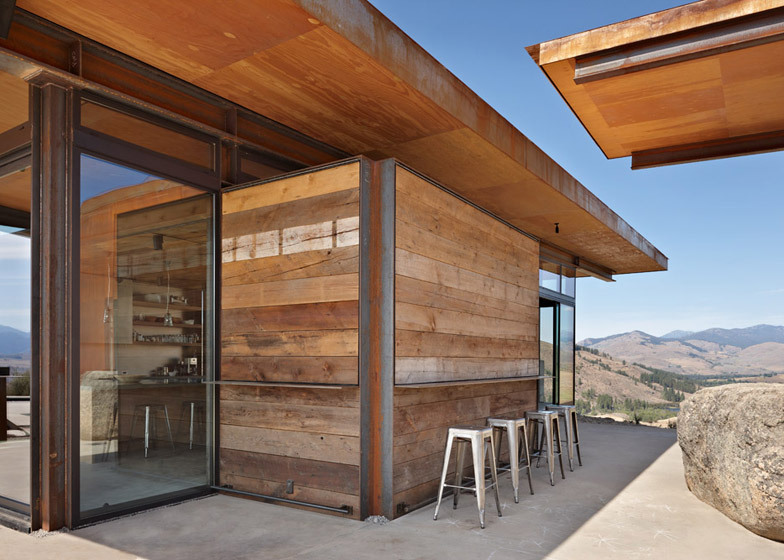 "It's like a little campground, and you go tent to tent," said Kundig. 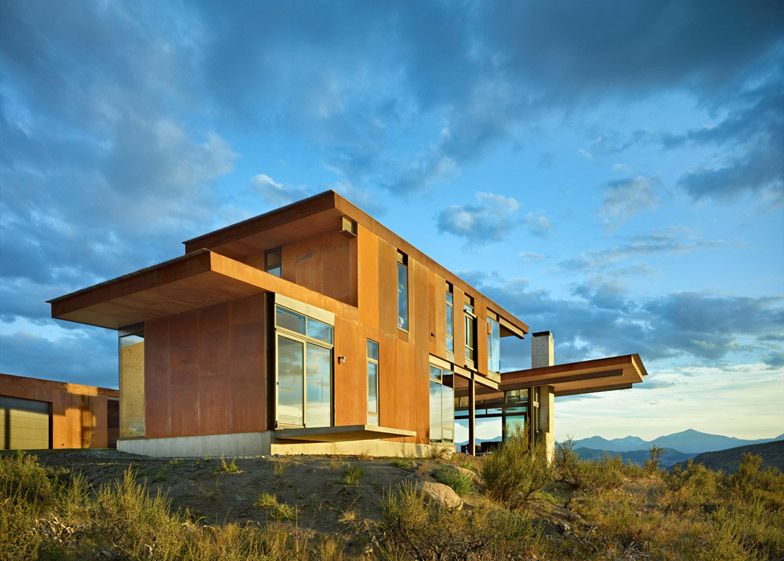 "The materials are tough on the outside, because of the high-desert climate, but the inside is cozy, like getting into a sleeping bag – protected, warm, and dry." 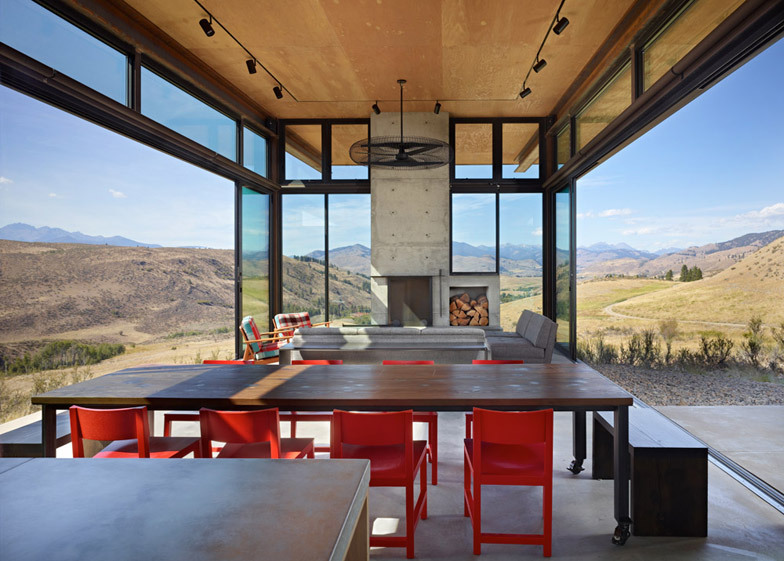 The first and most transparent of the four volumes contains the family's main communal areas. 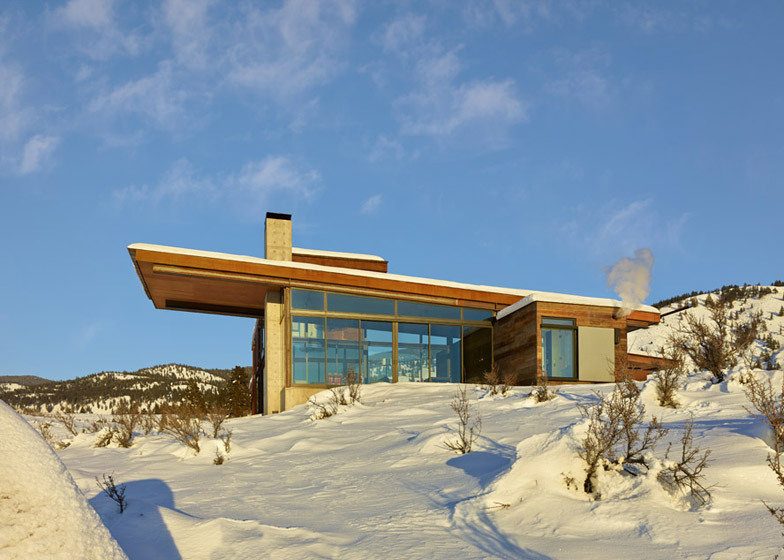 One large room contains the kitchen, dining space and living room, anchored by a raw concrete fireplace and chimney. 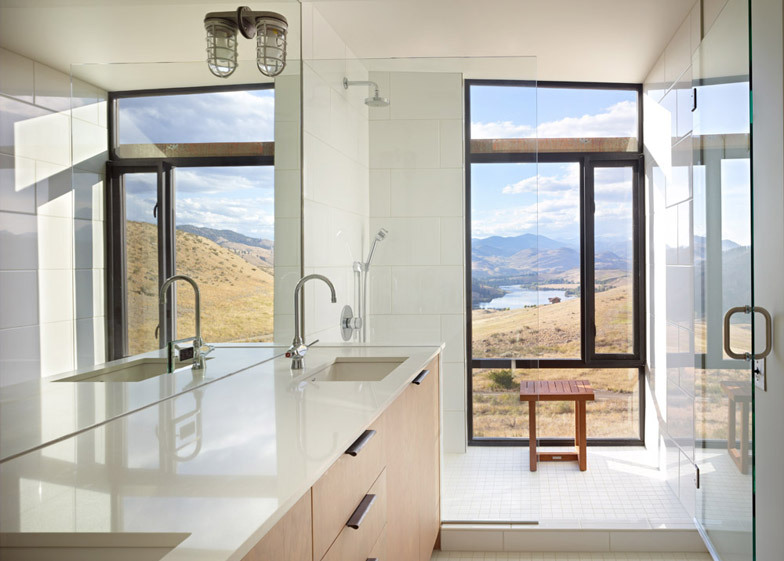 Panels of glazing dominate the walls, and these surfaces slide back so that residents can open the interior up to the elements. 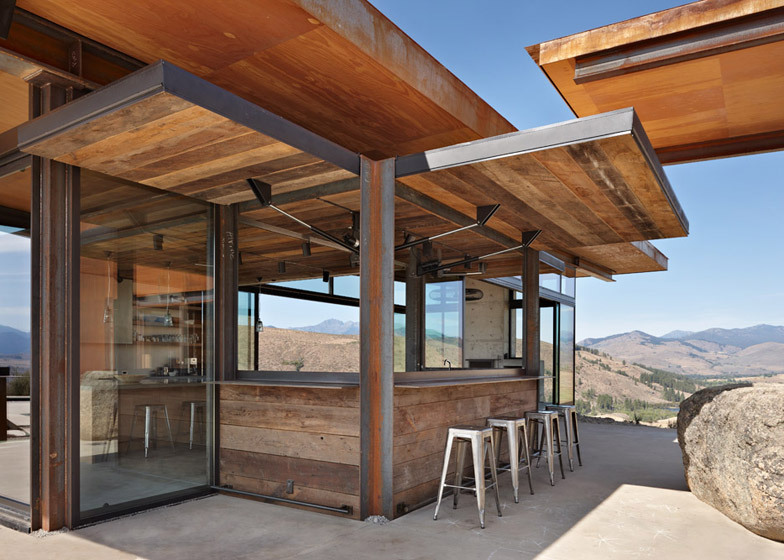 There is also a bar tacked onto the side of the block. 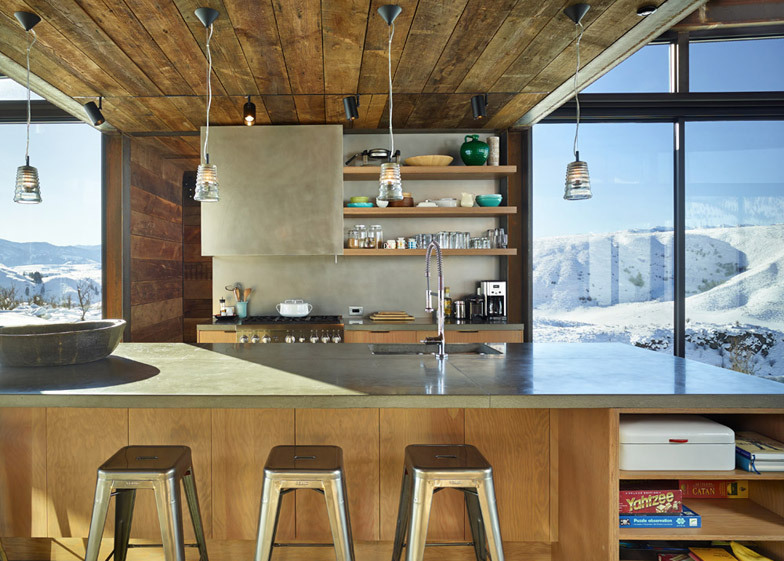 A two-storey block contains the den, which can be opened to an outdoor space sheltered beneath the overhanging floor above. The master bedroom and the children's room are contained upstairs. 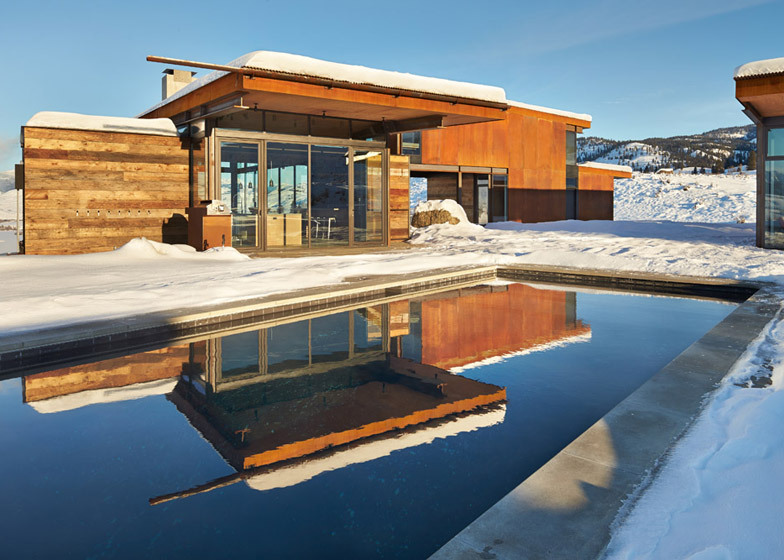 "The design embraces family life and entertaining," said Kundig. 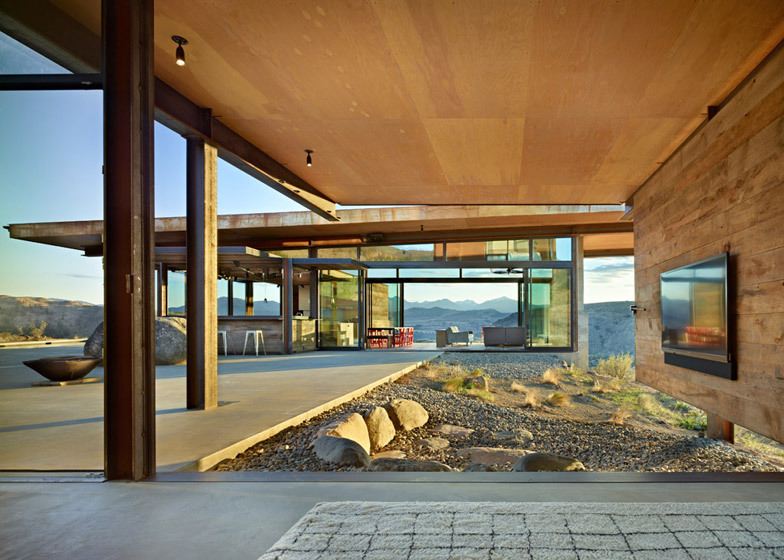 "For example one wall with a TV can either face inside or open up to face the courtyard. 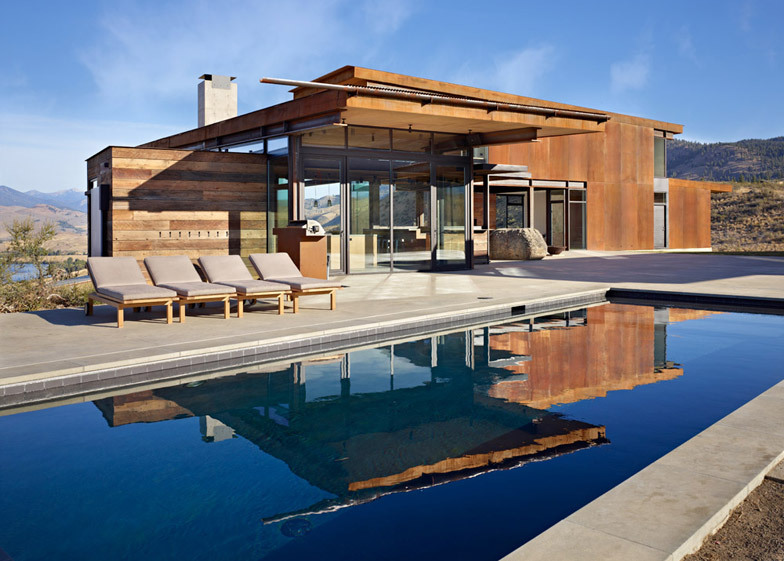 If there's a game on, everyone can watch from the pool area." "There's also a Coney Island aspect to the bar, where you push a button and the walls open up," he added. 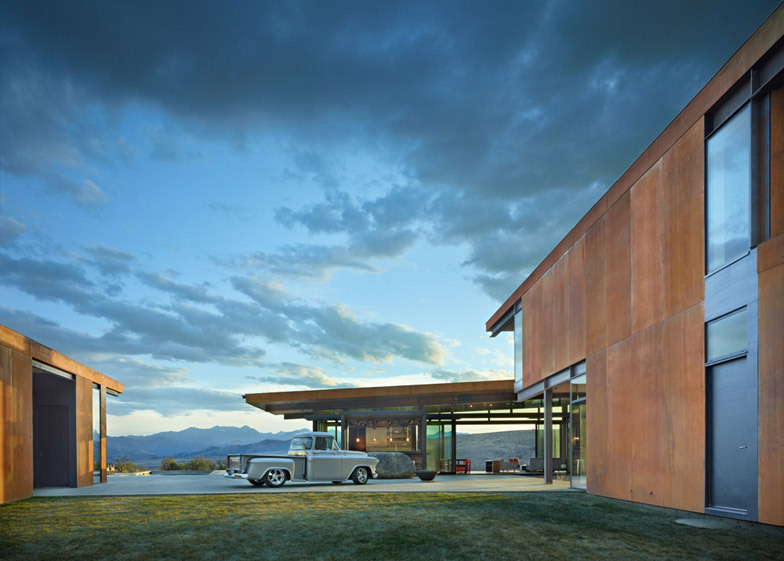 "It has turned out to be a particularly successful part of the architecture. Everybody hangs out naturally at the bar, and the fact that you can open it up is important to the inside-outside relationship we were seeking to achieve." 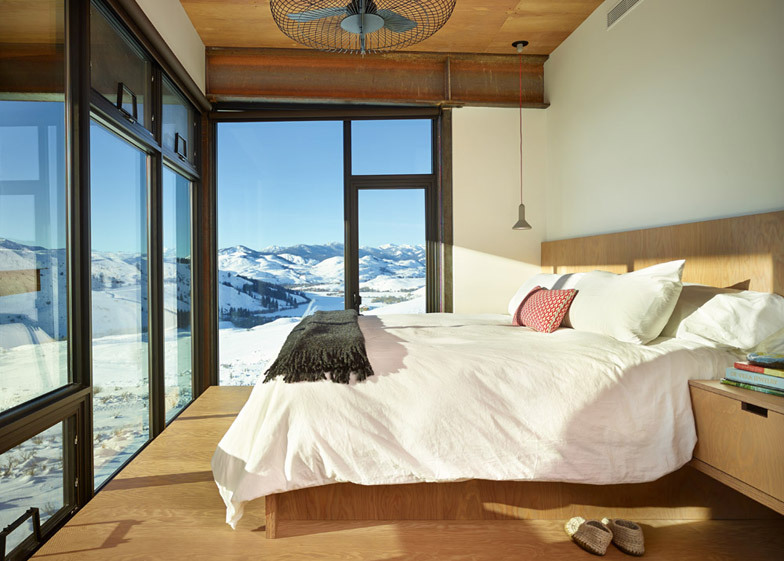 The two smaller buildings contain a dedicated guest suite and a timber-lined sauna, which features a single framed view over the valley. 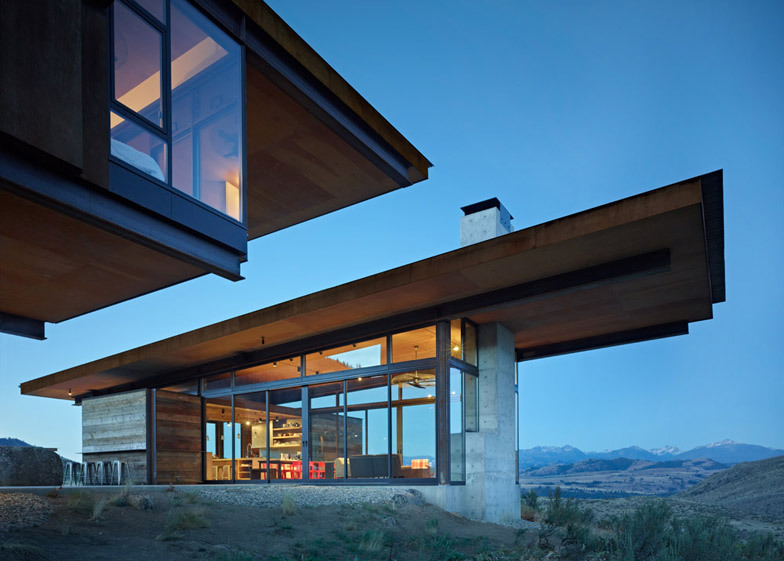 "The glass is very important," said Kundig. "I have never liked being in a room that doesn't feel like part of the outside." 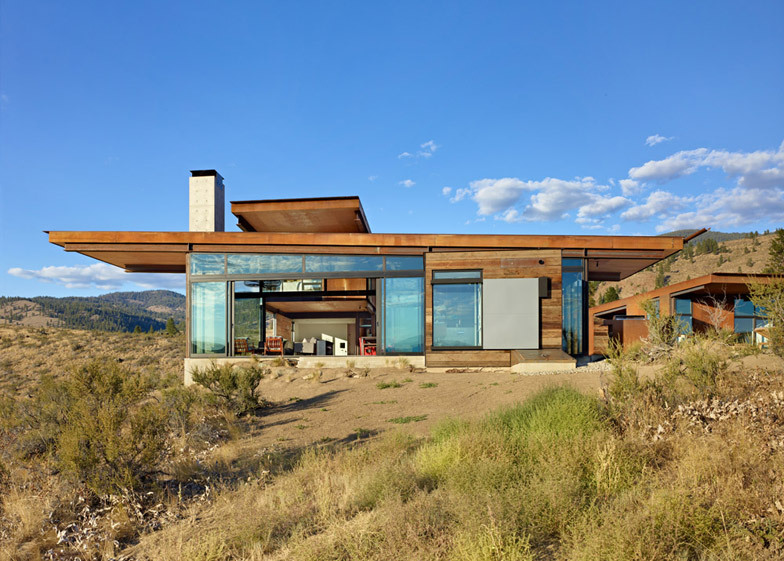 "I always like to take the amount of glass I'm allowed per code and, rather than sprinkling it around like pepper, concentrate it in one place to make a vivid connection to the landscape," he said. 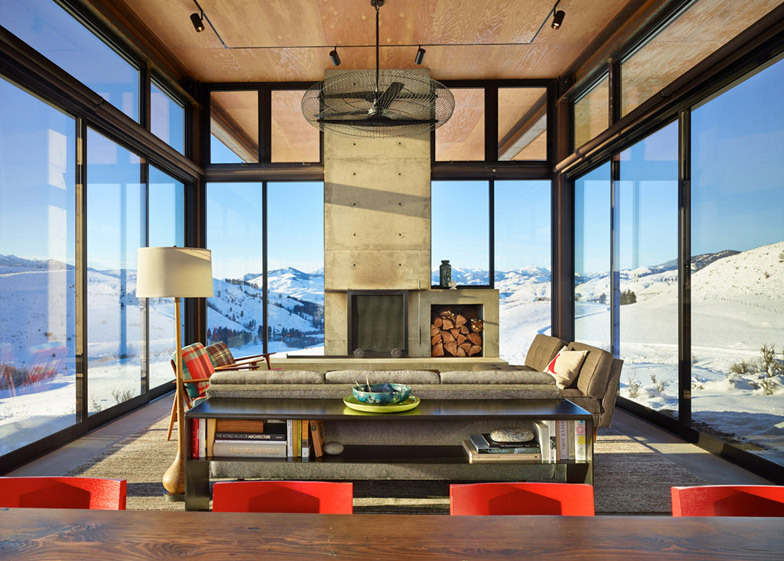 The big rock – the only thing that was on the site before construction started – is located next to the bar, where it now serves as a piece of furniture. 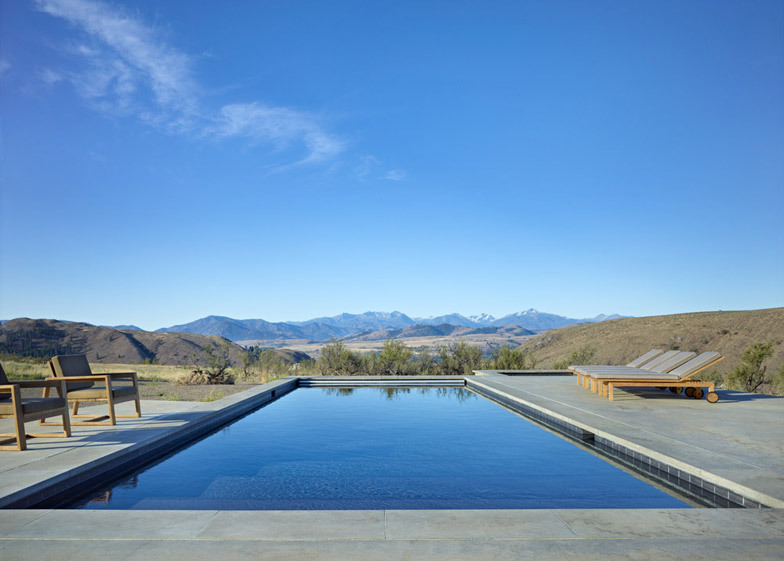 The swimming pools sit off to one side. 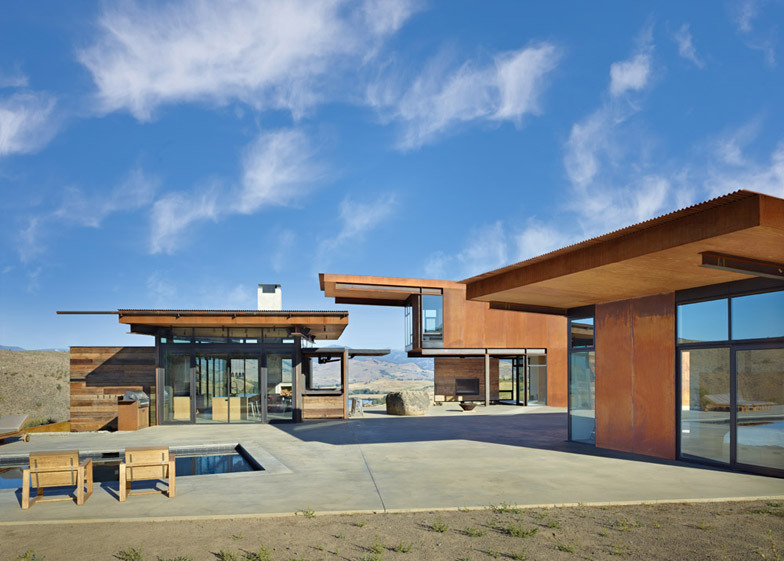 Olson Kundig Architects completed Studhorse in 2012, but it was recently recognised with a housing award by the American Institute of Architects. 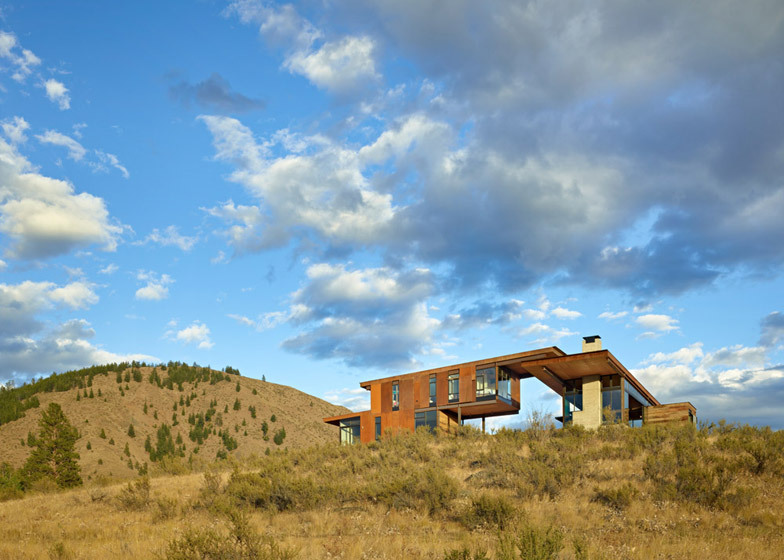 Kundig's other projects in rural Washington state include an island home nestled amongst huge boulders and a weekend cabin raised on stilts.